With rapid expansion of digital communication, we may be losing the capability of constructing informative or inspiring sentences, punctuated and capitalized correctly, composed of carefully chosen and correctly spelled words, and arranged in logically organized and sequenced paragraphs. Apparently the ancient Greeks and Romans didn’t have those skills either, but they seem to have had something much more sophisticated. Take a look at this image of a Greek manuscript from Wikipedia. Looks like Greek to me! 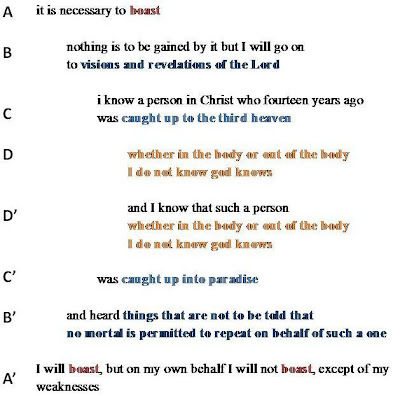 According to the Wikipedia article, this is the section of the New Testament we now label 2 Corinthians 11:33-12:9 (Chapter and verse designations were added only about 500 years ago.) Here it is in English, New Revised Standard Version, with all our normal grammatical helps removed and without the verse numbers. Still looks like Greek. In my math and science oriented education, 1948-1964, I missed all study of classical languages. Had I studied Latin, I would probably know all about chiastic structure or chiasms, but the first I ever heard of them was during Bible courses at Lutheran Theological Southern Seminary, 2002-2004. Take a look at these links for a quick introduction or a refresher and some examples. So, what is the point? Chiastic structures can be very helpful by pointing out where the writer intended to begin and end a sentence, a paragraph, or a longer passage. 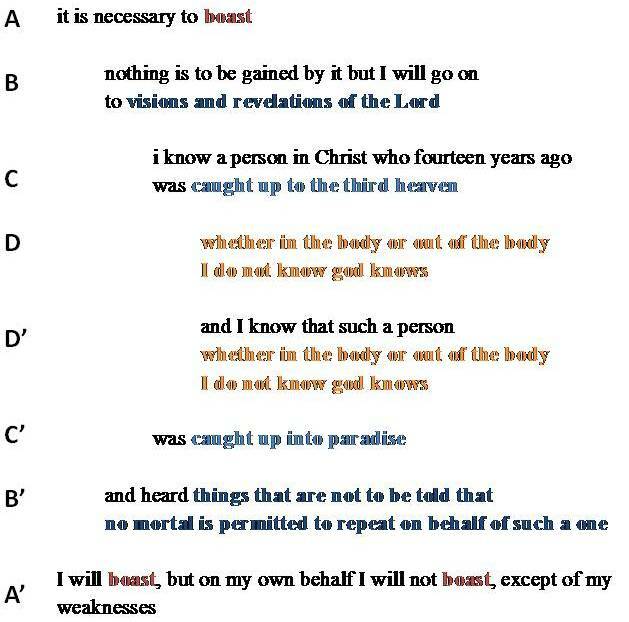 "Boast" in the above section may be considered an inclusio, bracketing the section or perhaps paragraph. So, whether it is important or not, I do not know, God knows, but it seems to me to be very useful in meditation on and study of Holy Scripture, searching for the deeper meanings. G.B. - Thank you for referencing my article, "What is a Chiasm?" It think you did a great job in analyzing those verses from 2 Cor 12:1-5. I have not found a lot of chiasms in Paul's writings, and where they seem to exist, they are rather simplistic such as A-B-A. The question that I try to make in my article is, "Why is it there?" 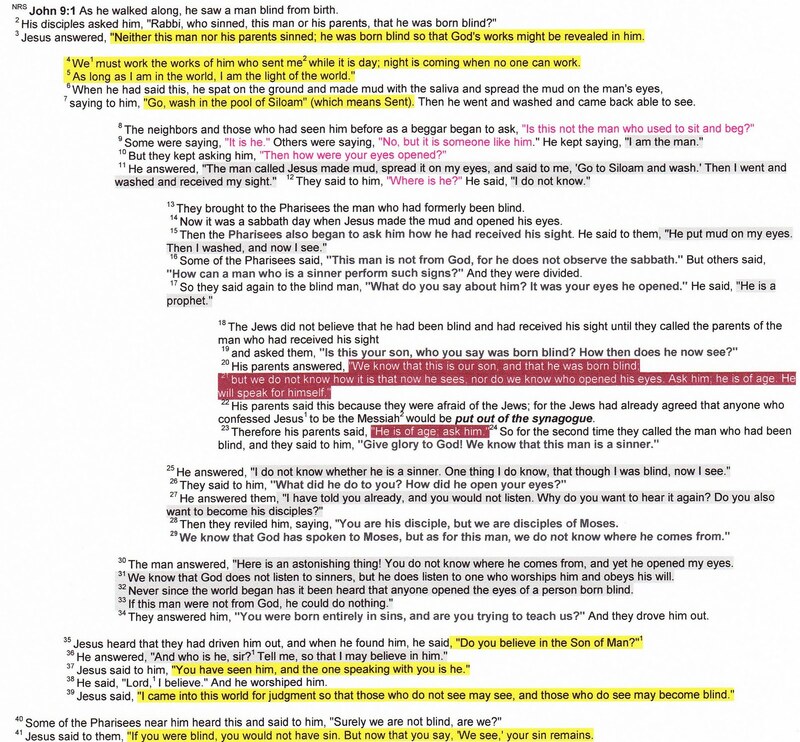 To me, the reader's response to the text is the most important part of the Scripture. After all, it is God's Word that is personally speaking to us. Regarding your analysis of John 9, this has been inspected by many people for its chiastic structure, so it is not surprising that you found it as well. I like how Peter Leithart analyzed it in "A House for My Name" which to me is an excellent manuscript. Leithart presents several different interpretations of John 9 which are all possible ways to see that text. In my book, "Joshua's Spiritual Warfare: Understanding the Chiasms of Joshua", I take the reader through my process of resolving the question, "Why is it there?" My response may not be yours, but I find it intriguing to see it from another person's perspective.